In a winter that witnessed a succession of storms that have affected many parts of the UK, calls are being made to understand what lessons should be learnt in order to be better prepared for future storms. Given the longevity and subsequent severity of the impacts across some parts of southern Britain, it’s easy to forget that the first affects of the winter storms were seen as far back as early December in Scotland with some of the highest coastal water levels on record. In the early hours of the 5th December a storm hit north west Scotland resulting in a significant tidal surge which travelled down the east coast of Scotland. 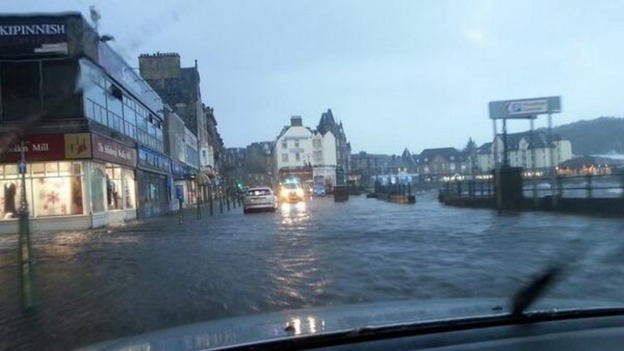 Commercial properties in Oban were the first to be impacted by flooding, followed by issues in Inverness, the Moray coastline, Aberdeen, the Firth of Forth and in Eyemouth, which witnessed their worst flooding in decades. The United Kingdom Coastal Monitoring and Forecasting group (UKCMF) commissioned a study to record basic statistics and facts relating to the recent coastal storms. One of the notable peak water level statistics was recorded at Leith with a peak of 3.71 metres above ordnance datum (associated surge level of 1m) being the largest on record and correlating to the magnitude of some of the impacts along the east coast. But were we prepared for a storm of this magnitude? It was the tragic deaths in Uist in the severe storms of 2005 that previously brought coastal flood risk into political and public focus. The ‘Coastal Flooding in Scotland’ scoping report recognised the benefits of flood warning in the coastal zone and emerging warning strategies started placing greater demands on a developing coastal forecasting science area. This has subsequently led to a number of significant developments which were tested during the recent floods. 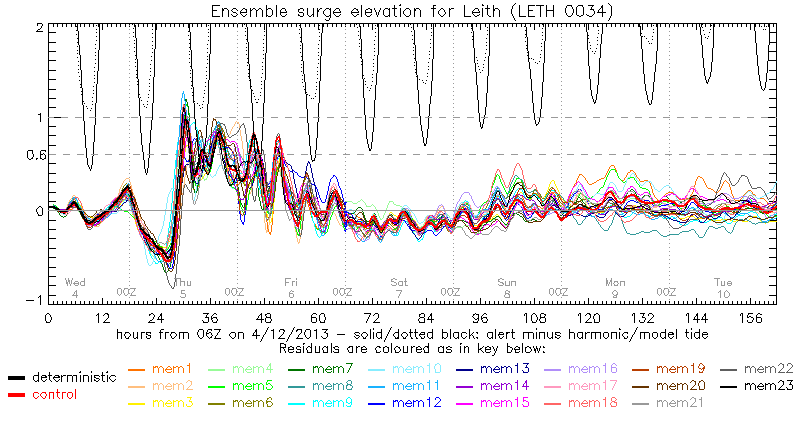 Predicted ensemble surge elevation for Leith from 4th December 2013. New coastal flood forecasting systems have been introduced including a system that underpins warnings along the east coast for urban centres such as Dundee, Kirkcaldy and Grangemouth – these typically benefit from 12 to 24 hours warning. This system is supported by much closer integration of meteorological models forecasting onshore impacts such as the UK4 wave model. However, as the demand for longer forecast times grow, so does the uncertainty in flood predictions. The emergence of ensembles of surge predictions out to 7 days is allowing the flood forecaster to quantify the uncertainty in the forecast and – in the case of December – issue guidance to emergency responders 4 to 5 days in advance of the flooding. The new forecasting capabilities in the south east did lead to a greater level of awareness of the emerging flood risk as we entered December. SEPA’s Floodline service had an incredibly busy spell with thousands of direct messages being issued to customers of the service however the true magnitude of the hazard may not have been realised until after the event. M. Cranston, L. Naysmith, A. Tavendale, L. McLean, P. Hart, C. Whitlow, C. Powis and K. Hu (2013) The Firths of Forth and Tay flood warning scheme and the storm of December 2012. ICE Breakwaters Conference, Edinburgh. This entry was posted in Coastal, Forecasting, Probabilistic, Risk communication. Bookmark the permalink.